Maly received his NSF CAREER Award for his research proposal, “CAREER: Small-Molecule-Regulated Signaling Proteins.” The goal of the research is to engineer mammalian signaling enzymes that can be regulated with cell-permeable small molecules. For more information about the NSF CAREER Award program, please visit the program website. 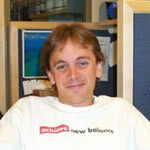 For more information about Dustin Maly and his research program, please visit his faculty page.